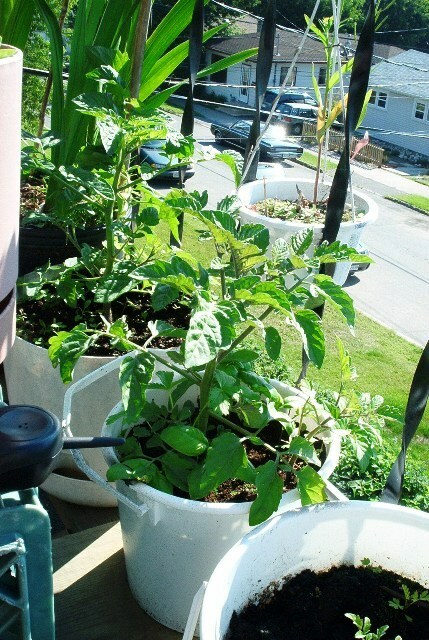 Balcony gardening can offer greater challenges than working a garden bed in your backyard. The first one is that it may be against the building rules to grow anything on your balcony and so by doing so, you may run into some problems with other tenants, the superintendent or the owner. The second challenge is the conditions, low light, or high winds can be common conditions on an urban balcony. However, if you can get 3-4 hours of sunlight each day, more is better, but if that is all you get you can still grow your own food. It is possible that the yield will be less or the plants will take longer to produce fruit. It is almost certain you will need to water frequently as the containers will dry out under the hot sun or high winds. Before planting anything get to know the conditions, especially how much sunlight you get on your balcony if it varies then place the containers where the sun visits the longest. Cherry Tomatoes, I use CampJoy but any cherry tomato will do well in a container and the bonus is you can grow basil in the same container. Two containers, 18 inches across and 2 feet deep will hold two tomato plants and two basil plants. Green Peppers, both peppers and tomatoes enjoy the sun but need heat so if the spot is cool, then I suggest planting something else. Plant peppers same as tomatoes without the basil. Pole beans need support; I use bamboo poles, available at the plant nursery. They are cheap and last for years. You can put two plants per 18 inch diameter pot. Peas, you will need a support and there are trellises that will fit into an 18 inch or larger container. They can also support themselves on balcony railings. Herbs, chamomile, borage, chives, thyme will all do well in a container. You could create an herb garden in one 24 inch diameter container and plant a few of your favourites. They will also help to bring in the pollinators when in flower. Gladiolas, I must have one ornamental per garden and the glad is an ideal choice. The bees are as necessary on the balcony as they are in the backyard. Fuchsia works as well. Morning glories can grow along railings. You can use anything that is deep and wide enough as long as it will hold soil in place. A drainage hole is essential and you may want to palce the container in another container to catch the excess water. If you are cramped for space you can use smaller containers and plant fewer seeds or seedlings per pot.